Instrument Clusters are common failing parts on many vehicles, especially the BMW 5 Series. The instrument cluster faults are not specific to certain models, all the BMW 5 Series E34 / E39 / E60 / E61 can be affected, with the faults varying from model to model. Faulty instrument clusters can either be repaired / rebuilt or replaced however each of these options come with different cost implications. If you decide to replace your instrument cluster, it will only come with a 12-month warranty and it will also need to be coded / programmed to your vehicle which will be done at an additional cost. You can also purchase a second-hand used part which will work out cheaper initially, and will come with a limited warranty of 30-90 days. However, it will need coding / programming to your vehicle, and all used instrument clusters must also be calibrated to read the correct mileage which is usually at an additional cost. Here at Sinspeed, we are able to fully test & repair the BMW 5 Series Instrument Cluster units using only genuine OEM components to ensure that each and every rebuilt dashboard speedometer meets and exceeds OE specifications. The unit will not require coding when refitting back to your vehicle and will not and we also provide a Lifetime warranty with all our repaired instrument clusters for 100% customer satisfaction! We also offer fitting services if required. There is a list of the most common part numbers listed below which have been in our workshop for repair. This is not a complete list so if you find that your part number is not listed on here or have any queries, call us on 0203 815 9441 today or drop us an email! Tags : BMW 5 Series Dashboard Repairs, BMW 5 Series Instrument Cluster Problems, BMW 5 Series Instrument Cluster Repairs, BMW 5 Series Speedometer Problems, BMW 5 Series Speedometer Repairs. We do offer testing and repairs for the 2008 BMW 5 Series instrument cluster and I’ve sent you an email with full pricing and information for our services. My dad has a BMW E34 520i (M20) from 1989. The instrument cluster in his car is not fully functional and the Odometer stopped updating the mileage. speed, RPM, Temp and Fuel Indicators are all perfectly functional. would it be possible to Have it fixed and also what would be the approximate Cost? Thank you. 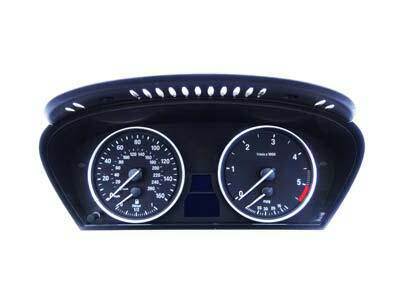 2008 BMW 550i/e60 Series instrument cluster can you send me the full pricing and information for your services. I have a 1992 bMW 520i with a completely dead instrument cluster. Would i be able to get a qoute for a repair? I would recommend getting an auto electrician out first to investigate the issue. If the fault is within the instrument cluster then we can definitely help you, we can fully bench test and repair the unit is faulty. All remanufactured units are returned with a lifetime warranty and will be plug & play, meaning no programming is required when you reinstall it. We always recommend having your original unit repaired where possible as you can never guarantee how long a used part will work, if at all. The unit part would also need reprogramming to pair with the vehicle and have the mileage corrected, which are additional costs that can be avoided when repairing your own unit. I have sent you an email with full pricing and information. If you have any questions, please reply to the email and we’ll be happy to assist you.